These days, you're pretty much guaranteed a children's musical that's likable and energetic from Theatreworks, and The Plant that Ate Dirty Socks is no exception. Based on Nancy McArthur's novels of the same name, this new "family rock" musical has silly charm to spare. If you're not familiar with McArthur's popular children's series, the offbeat story is just as the title advertises (think Little Shop of Horrors lite). It focuses on two young brothers who adopt a plant with some strange dietary needs, and become closer as a result. Michael the slob (Jason Williams), and Norman the neatnik (Lance Rubin) soon realize that their oddball plant needs to be kept secret from their parents, popular kid Jason (Jeffrey Omura), and snoopy cheerleading neighbor Patty (Lauren Marcus). The tale is given a contemporary musical treatment, with rock-influenced songs (the orchestra consists of a pianist and drummer), and plenty of fun terminology (dudely, fly, freakazoid, wicked). Composer/lyricist Joe Iconis has created a musically exuberant score and playful lyrics that fit the story. And director John Simpkins keeps the energy high throughout, assisted by the bouncy choreography of Jennifer Werner. Williams and Rubin are both likeable as the two brothers, but William's messy, teddy bear-like appeal is more believable than Rubin's obviously fake nerdy act. Kilty Reidy and Lorinda Lisitza as their parents are sometimes over-the-top. They've been given some hilarious costumes from designer Tracy Christensen (like Dad's businesslike purple polka-dotted pajamas, complete with tie and briefcase). 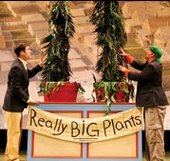 The Plant that Ate Dirty Socks is solid and entertaining even though not quite as memorable as earlier Theatreworks productions like Junie B. Jones or Anne of Green Gables. The supporting characters tend to be overly generic even for a kid's show, making the story feels a little forced at moments. Ultimately, what makes the show so appealing and work so well though, is its unabashedly weird heart. Whether dressed up as a robot or a gorilla to solve a mystery, trying to teach their plants to speak, or showing off their sock-eating plants at a science fair, Michael and Norman always dish up a large doses of silly fun. Tickets: Free and available on a first come, first served basis in-person at the Lucille Lortel Theatre Box Office on the day of the performance, one hour prior to curtain time. Individual reservations cannot be made in advance. From 7/16/08 to 8/22/08; opens 7/24. Mon, Tues, Weds and Fri @ 10:30 a.m. and 1 p.m., Thurs @ 10:30 a.m., 1 p.m. and 6:30 p.m., Sunday @ 2 p.m.
Feel free to add detailed comments in the body of the email and state if you'd like your comments published in our letters section.